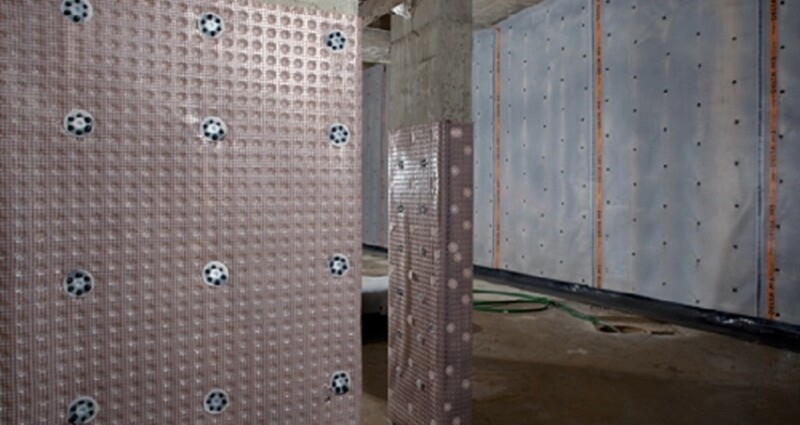 As well as waterproofing existing basements, DELTA® products can also be used in new construction. Properties undergoing refurbishment frequently have basements that will need upgrading so they can become drier and then converted into there desired room. These basements may be used for storage, offices, bedrooms, games rooms, toilets, etc. which all require different levels of dryness. Buildings/structures aren’t always dry, water and water vapour will always exist. To make your basement fit for refurbishment you must have control of the moisture and water that’s in the actual building structure and also the humidity and temperature, each of these will prove vital to rid your basement of any dampness and maintain a dry building. To achieve this you need to apply a waterproof coating inside the walls and floors, this needs to be done before insulation or decorating. Once the room is waterproofed/damp-proofed the air needs conditioning to maintain the right levels of humidity through sufficient ventilation or air conditioning. If this specification is not met then any moisture in the home will cause the humidity levels to rise. Areas below ground level are prone to condensation, occurring on the coolest surface so steps must be taken to prevent condensation causing problems. DELTA® have the right products for all your needs. DELTA®-MS500 on the walls fixed with Qwik-Seal Plugs, DELTA®-MS20 on the floor, both sealed with Tape and Corner strip at the joints. DELTA®-Drainage Channel is installed around the perimeter of the room collecting the ground water draining away to a Dual V3 Sump Pump.